Dermapril-SP - Does Dermapril-SP Work? Question: I am a marathoner and have started seeing the wrinkling effects from the sun on my face during my long runs. My running partner suggested Dermapril, which she says contains something called Matrixyl that really works on wrinkles. What is Matrixyl? Answer: Matrixyl 3000T is a patented compound found in many anti-wrinkle creams, and is the main active ingredient in Dermapril-SPT, an anti-aging cream made by a company called Rauscher | Bekke LLC, based in Miami. It has been shown in independent clinical trials to reduce the appearance of wrinkles by boosting collagen production, as well as two other essential elements needed for smooth skin. 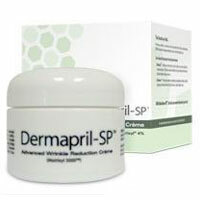 Dermapril also contains ArgatensylT, an oil extracted from the Argan tree, which is a Moroccan plant similar to olives. Argan oil has been used for centuries in natural skin and hair care products. The Dermapril website claims that clinical testing has shown an immediate and measurable decrease in wrinkles from applying ArgatensylT, but doesn’t mention any specifics of the studies. Dermapril is hypoallergenic and safe for sensitive skin according to test results on volunteer subjects conducted by an independent research lab over an eight-week period. You can find a full list of ingredients in the FAQ section of the website, which is helpful for those with sensitive or allergy prone skin. You may try a 14-day free trial through the website, however you will be charged the full product price if you do not cancel your membership before the 14 day period ends. All product purchases after this period are non-refundable. There are only two testimonials on the website and a before/after animation that comes with a disclaimer, “Simulated imagery. Results not typical.” There are before and after photos showing wrinkle reduction, but it is not clear if these are from Dermapril use or Matrixyl itself. If you do shop for an anti-wrinkle product in a health store, pharmacy or on the Internet, you’ll often find hundreds of different brands containing a confusing array of ingredients. You may be tempted to experiment with different products until you find one that works. But this approach may be expensive. More importantly, not all products contain the quality and quantity of necessary ingredients to positively promote long-term improvements on the appearance of wrinkles and an overall healthy complexion. That’s why you’ll need to do a little bit of research to find the best, most potent brand for your needs. Lee Mann, our respected health and beauty expert, did a fantastic review on wrinkle creams and their actual effectiveness in a recent feature, the results are quite surprising.